The Syrian Hamster, also known as the Golden Hamster or the Teddy Bear Hamster, are small rodents of the Cricetinae family. Due to their docile and solitary nature, Syrian Hamsters are one of the most popular hamster breeds as house pets.Usually found in the wild in Turkey and Syria (where it gets its name), they have spread throughout the Middle East and domestically into other parts of the world. Numbers in the wild are low as their natural habitat is under threat, but domestic numbers are stable due to successful captive breeding programs. Along with making great pets, Syrian hamsters are also used for scientific research. It is believed that the domestic Golden Hamsters can trace their lineage to a single family that was brought from Syria to Israel in the 1930’s. 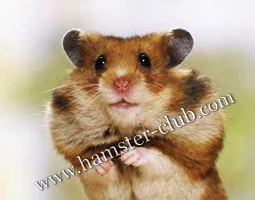 In captivity, Syrian Hamsters can live up to a maximum of four years, but most live for around two years. This is usually less in the wild.